Are you exploring the possibilities of starting, buying, or expanding a business? Discover what it takes by charting your course with this free seminar! Small Business Basics is a free, two-hour seminar that will answer your questions about starting, buying, or expanding a small business. This seminar will take the confusion out of your efforts, and help you to avoid costly mistakes and unnecessary steps. The Ohio Small Business Development Center (SBDC) Program is funded in part through a cooperative agreement with the U.S. Small Business Administration. The SBDC program is also funded in part by the Ohio Development Services Agency. All services are extened to the public on a non-discriminatory basis. Language assistance services are available for limited English proficient individuals. Reasonable accommodations for persons with disabilities will be made if requested at least two weeks in advance. 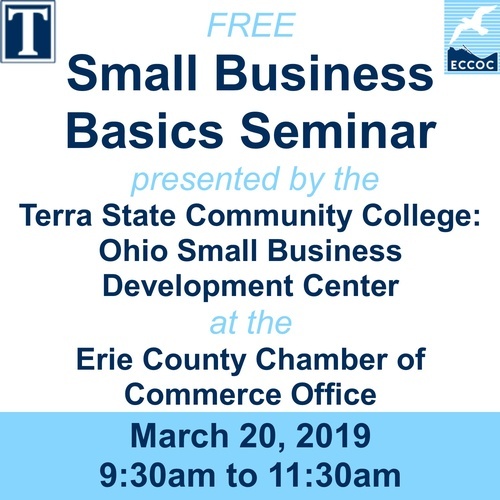 Contact the SBDC at Terra State Community College, 419.559.2210.